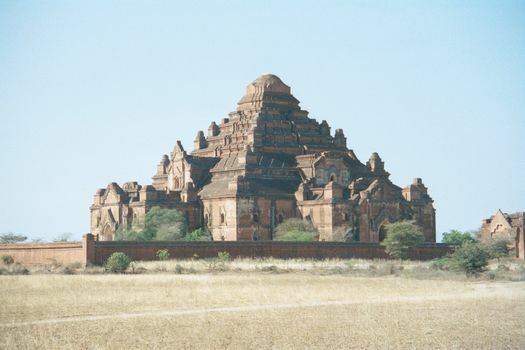 The builders of Pagan were very conservative, but the biggest change in Pagan's architectural style occurred relatively quickly during the reign of Anawrahta's grandson, Sithu I. 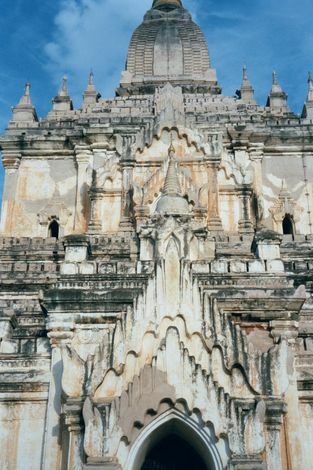 Unlike the horizontal Kyauk-ku and Nan-hpaya, Sithu's temples rise toward the heavens, elevating the "cave" to the spiritual realm. So ever after did all sizeable temples at Pagan. Later innovations were minimal, surviving even the trauma of the Mongol invasion of 1287. 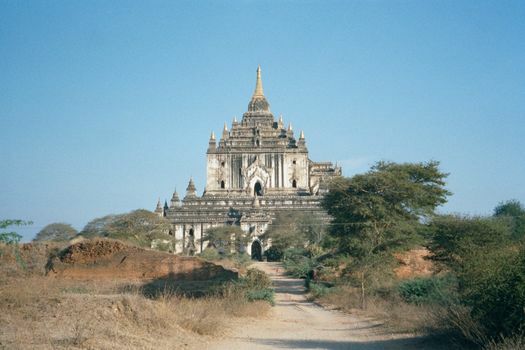 Shwe-gu-gyi, the "Great Golden Cave," built about 1131 by Sithu I. 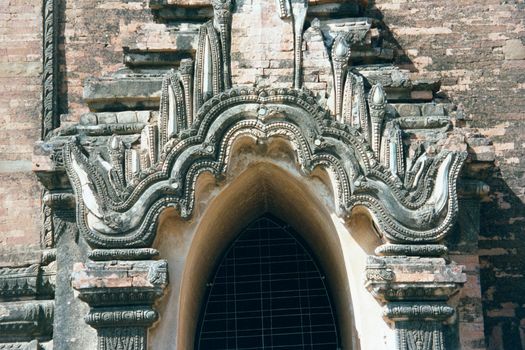 Unlike Anawrahta's temples, this one, like a Gothic cathedral, emphasizes the vertical. 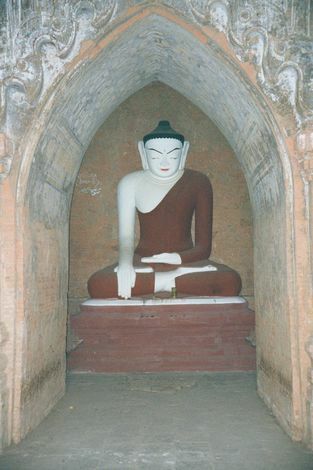 That-byin-nyu (the "Omniscient," referring to the Buddha) was also built by Sithu I but follows Shwe-gu-gyi by 20 years. It not only emphasizes the vertical but creates an upper-level shrine reached by stairs. In the foreground is a bit of Pagan's remnantal city wall, built about 850, roughly 200 years before Pagan became an imperial power. 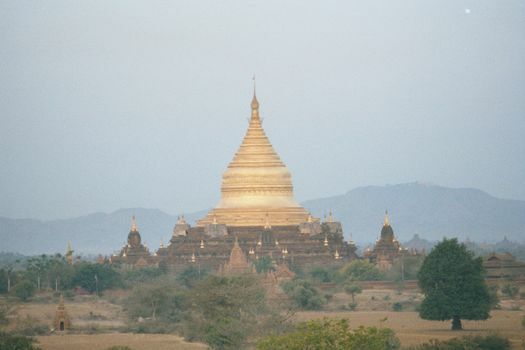 It forms a backwards L, abutting the Irrawaddy, whose curvature forms the other sides of the city's perimeter. The enclosed area is about one square mile, though changes in the river's course have made it smaller than it once was. 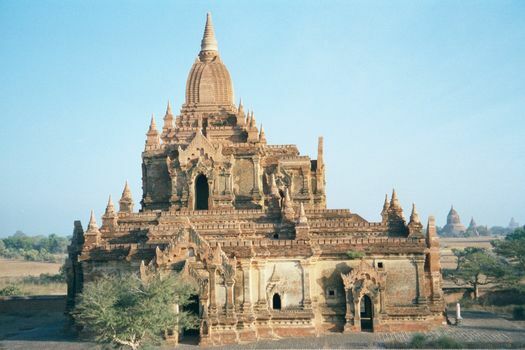 Dhamma-yan-gyi, a veritable mountain-cave begun in 1165 by Sithu I but never finished. (Why? One explanation is that Sithu was about to rise from his deathbed, which prompted an ambitious son to smother him. The son had no wish to increase his father's merit and so ordered "down tools.") 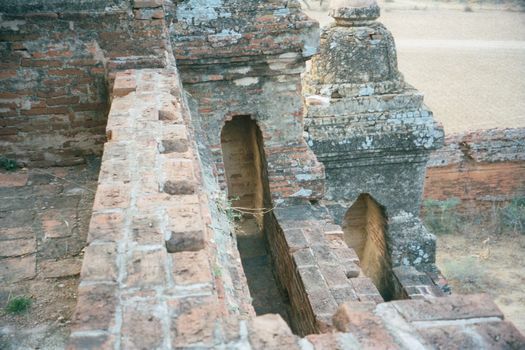 Despite its immense bulk, the temple has only one level, and the inner ambulatory, through which pilgrims might have passed, was immediately blocked with rubble. It remains blocked today, not only by rubble but by modern gates that keep visitors completely outside. The zedi evolved, too. 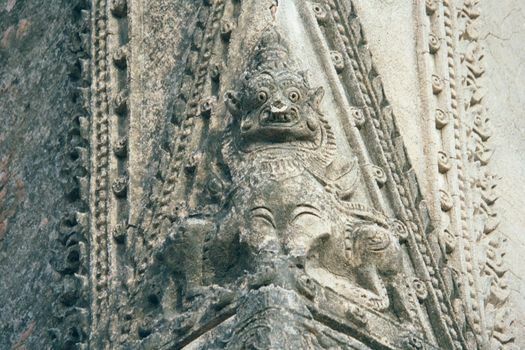 This is Sapada, named for a monk of that name who visited Sri Lanka and returned to Pagan in 1181. 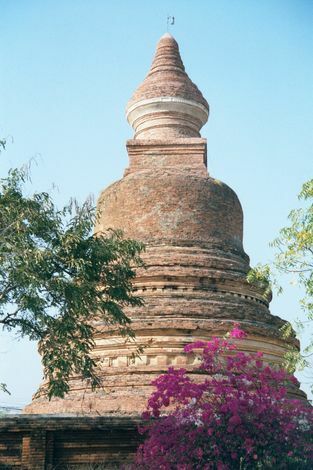 He built this Sri Lankan-style pagoda, whose treasure is housed in the box-like tabena above the anda. It's one-of-a-kind at Pagan. 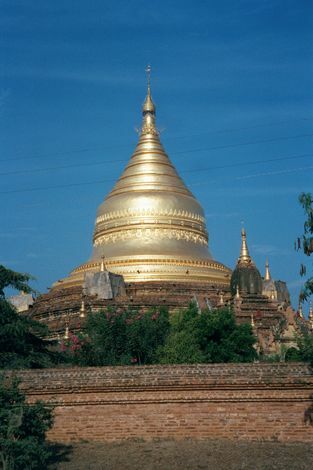 Here, in the Dhamma-yazika, is a uniquely Burman innovation: pentagonal terraces. 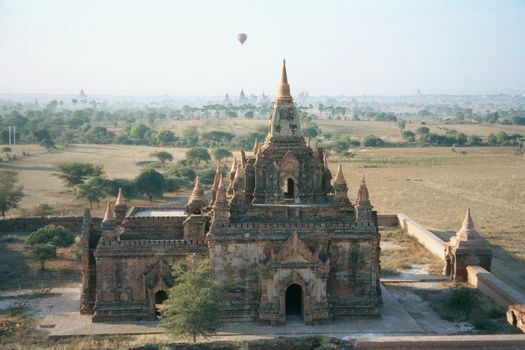 Completed in 1196 by Sithu II, the pagoda indicates the strength at Pagan of the cult of Mettaya, the Buddha-to-come. (A century earlier, Anawrahta had hoped to see him in a future life.) The pentagonal design is simply explained: Mettaya is the fifth Buddha of this cosmic cycle. The gilding is recent and occurs not only on the main pagada but on the small temples that mark each of the five sides. 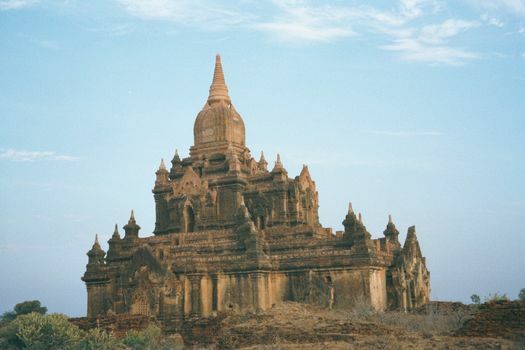 Sula-mani, the "crowning jewel," built before 1225 by Sithu II. 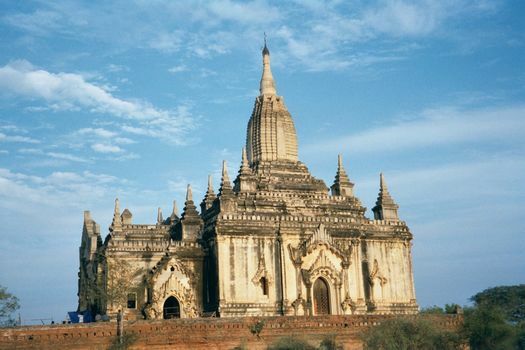 This is the temple that defines the mature Pagan style, with the elevated shrine of Than-byin-nu and the mass of Dhamma-yan-gyi. Shrine and hall are duplicated on each of the two levels, which are connected by hidden stairs. Want to see the upper level? Sorry: it's padlocked. The Sula-mani facade, from pediment to sikhara. The plaster decoration is in good shape, as in this flaming pediment. A smaller version of the two-tier gu. 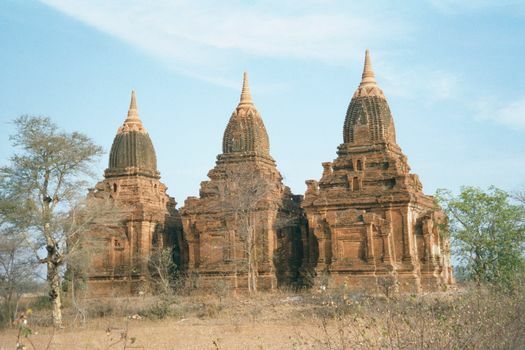 This is the South Gu Ni, one of two very similar temples in the Sula-mani style. In these cases, though, the stairs are open, permitting this picture from the top of the adjacent North Gu Ni. In the background, a hot-air balloon carrying tourists and periodically huffing as it drifts past. The north Gu Ni, showing the structure of double-stacked shrines and halls under a convex sikhara. The established form was repeated many times. Here: Tayok-pye, or "Fleeing from the Chinese," in reference to the king's behavior when the Mongols arrived in 1287. 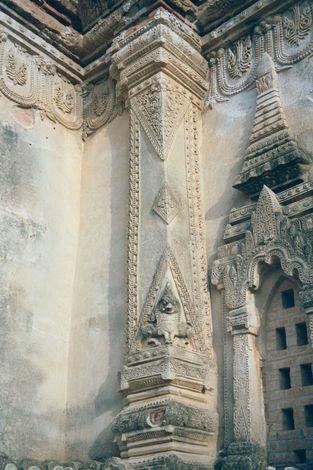 The decorative motifs are like those at Nan-hpaya, built centuries earlier. A close up of Min-o-thi-la, a twin-bodied lion. 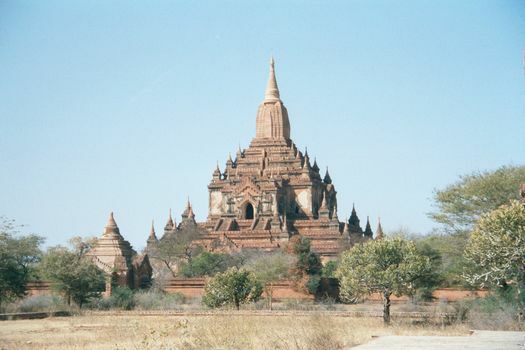 Close by, Paya-thon-zu, "three temples," also from late days. The rooms are dark but remarkable for their paintings. 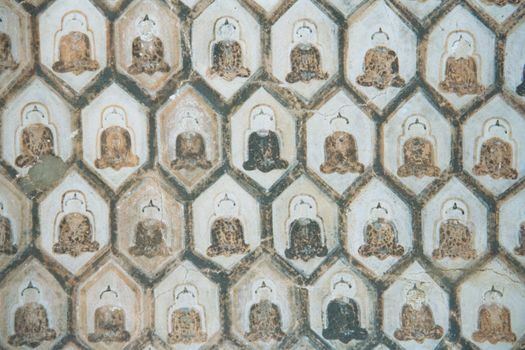 Buddha images are arrayed in a honeycomb. 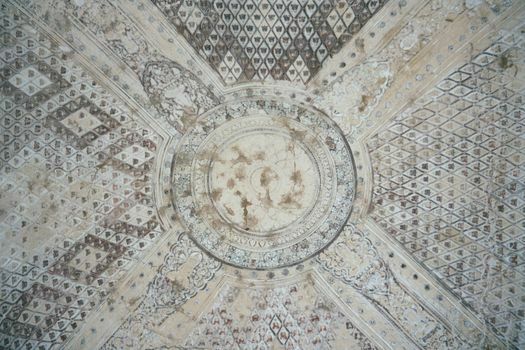 The ceiling vault is decorated with hundreds of Buddha images around the lotus pool of creation. 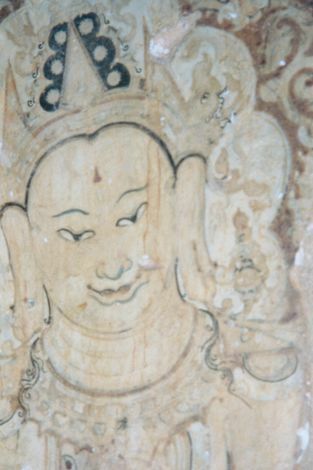 On the wall, a bodhisattva. A rare post-Mongol innovation: Thisa-wadi was built in 1334, 50 years after the Mongol invasion, and it pushes the Pagan style into a one-of-a-kind three-tiered form. 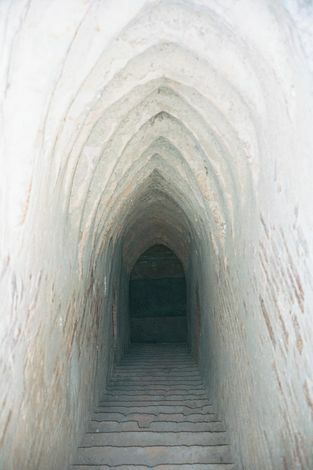 The stairs, traditionally, are hidden to the side. 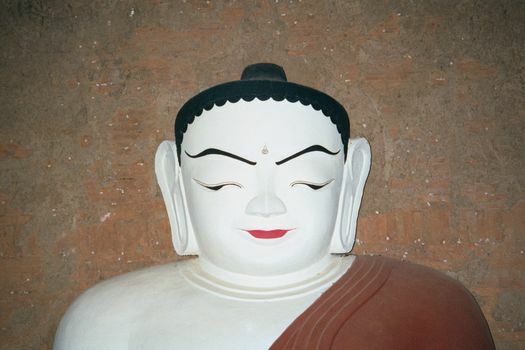 The Buddhas within are modern and rote but faithful to classical iconography: here, in the position of bhumisparsamudra, the Buddha touches the earth with his right hand, a sign of the moment that he attained enlightenment. Hence the sly expression: "I know something you don't know." Even a modern production like this follows the canon, which dictates three folds in the skin of the neck, ears of the breadth of eight fingers, and a long, thin upper lip over a short, full lower one.